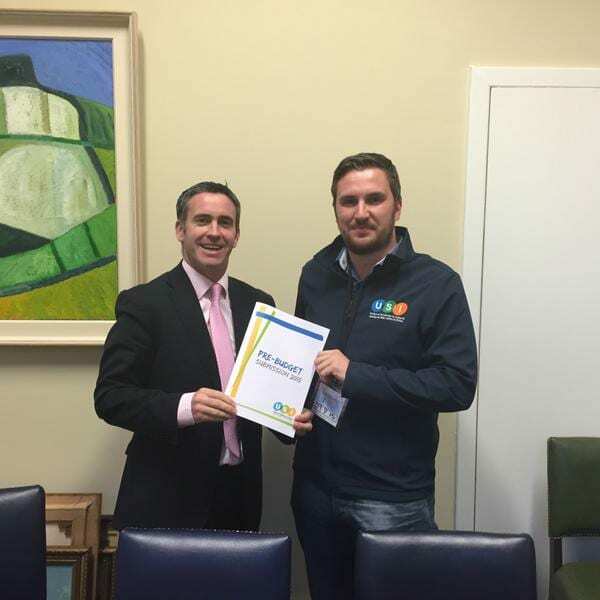 The Union of Students in Ireland and Fine Gael’s Junior Minister for Education, Damien English, met in Leinster House yesterday to discuss the student accommodation crisis and the impact the Budget will have on financially struggling students across Ireland. Fine Gael’s Damien English said the lack of funding due to the inherited budget is a problem, but supported the USI pre-budget 2015 objectives. He emphasised that executing the objectives, such as increasing student grants and accommodation are long-term goals, and not solvable immediately. As a short-term solution, in 2014 the USI launched the ‘Homes for Study’ campaign which includes the website homes.usi.ie. This allows homeowners to list their spare rooms and their conditions with the objective of providing students with contacts for those willing to help. USI also continues to promote the ‘Rent a Room Relief’ Scheme to homeowners where a room can be rented for up to €12,000 tax free.